Shade, the Changing Girl #4 contains an absolutely superb back-up story featuring Element Girl. Though brief, the story is both very funny, and completely heart breaking. Powerful and perfect, it far outshines the lead story in the book. 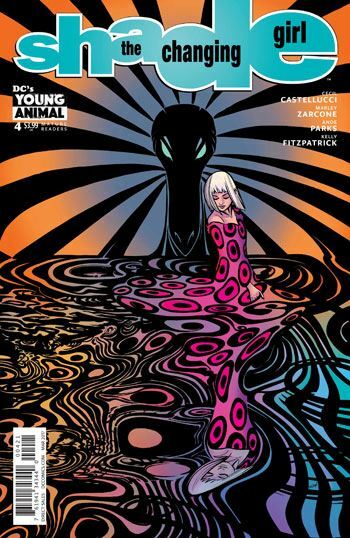 In fact, to be honest, I am getting a bit worried about the direction Castelucci is taking Shade, the Changing Girl. The Peter Milligan series which I loved so much started really strong, with Shade travelling across the US chasing the Madness stream. As the book progressed, it became more and more about Shade and his relationships, and eventually turned into such navel gazing that I completely lost interest. I fear I am seeing the same thing happening here, only much more quickly. 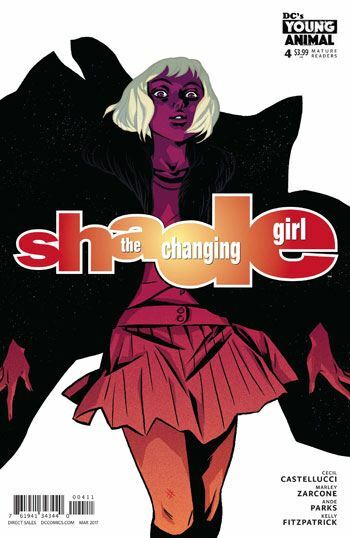 Now, part of the problem is that Castelucci has invested so much of the tale into how the new Shade is adjusting to life as a teenage human girl. And this is interesting, no doubt about it. I enjoyed her attempts to make up for the behaviour of her human host before Shade took control of the body, and the various reactions these gestures elicit. There is a decent romantic triangle brewing, and the parents are being explored well also. But so far the only larger plot thread is that of Mellu, back on Meta, and the pursuit of the stolen M-Vest. It’s not that I want to see Shade pitted against Darkseid or in a death match with Lobo, but I would like to see her character and issues explored as she deals with something other than the life of her host body. Still, I did enjoy this issue, despite my caveats. Marley Zarcone does some very nice work with the art, and I quite liked how the Meta-spots wind up resembling vinyl albums in the one panel that features the girl’s turntable. I’m just not certain how many more issues I will enjoy.